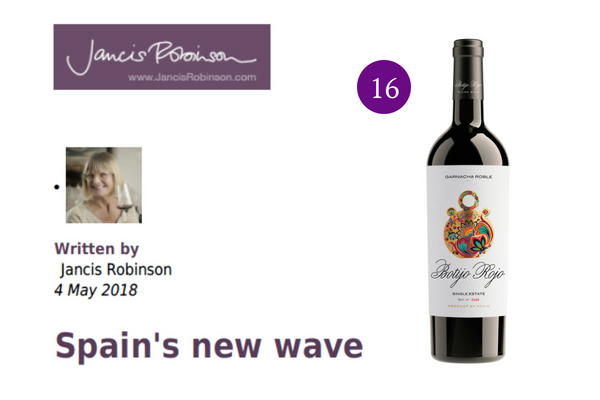 She gave great scores to Bodegas Frontonio, including 17+ -Jancis scores out of a maximum of 20- to several wines in the range but it was the score of 16 points for the humble Botijo Rojo 2016 that made us most excited. Around 55,000 bottles are produced annually of Botijo Rojo from Bodegas Frontonio’s Garnacha vines in the Valdejalón. It is fermented using indigenous yeast, followed by 10 – 15 months ageing in concrete tanks to create a fresh, balanced and fruity wine that is enjoyed by everyone and serves as a flagship for the Aragón region. The 2015 vintage was awarded 90 points from Robert Parker, so we are delighted that the new 2016 vintage is already getting rave reviews. Just like a botijo – the straight-forward yet ingenious earthenware pot that is used to cool water by growers working in Spain’s hot vineyards – it proves that beauty can be found in the simplest things.